1983 – Season 1 (2018) – What's New on Netflix Canada Today! 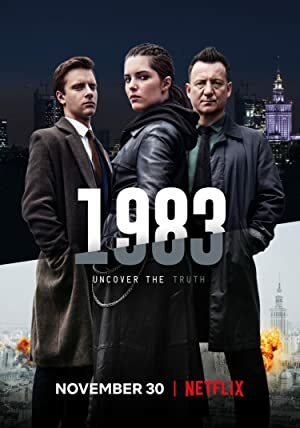 Decades after a 1983 terrorist attack, a law student and a cop uncover a conspiracy that’s kept Poland as a police state and the Iron Curtain standing. In a totalitarian Poland, law student Kajetan Skowron and detective Anatol Janów unravel a terrible conspiracy stretching to the country’s foundations. The deeply frozen Cold War is heating up. Twenty years after a devastating terrorist attack in 1983 that halted the course of Poland’s liberation and the subsequent downfall of the Soviet Union, an idealistic law student and a disgraced police investigator stumble upon a conspiracy that has kept the Iron Curtain standing and Poland living under a repressive police state. Now, in 2003, after two decades of peace and prosperity, the leaders of the regime enact a secret plan made with an unlikely adversary in the 1980s that will radically transform Poland and affect the lives of every citizen in the nation – and the world. What these two men discover has the potential to ignite a revolution and those in power will stop at nothing to keep it a secret.